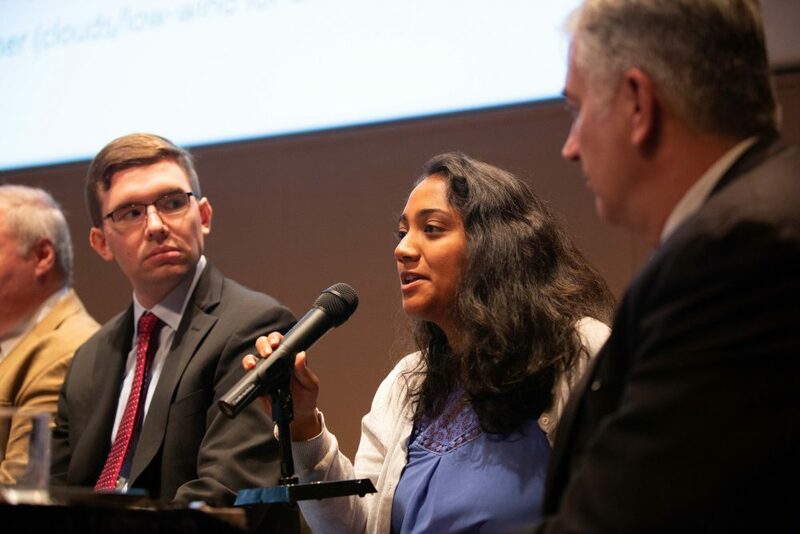 In late September 2018, researchers shared findings and recommendations from the new interdisciplinary MIT study, The Future of Nuclear Energy in a Carbon-Constrained World, at a series of events and meetings in Washington, DC. 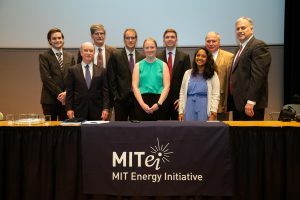 On September 25 and 26, study participants from MIT and other institutions involved in the report spoke with a variety of energy stakeholders and discussed nuclear energy’s potential to help address climate change—and how industry and government could solve issues of cost and policy currently limiting that potential. For four of the graduate students from the research team who participated in the events, the DC visits held additional significance, as they saw their years of work on the study come to fruition. The lead researchers on the study repeatedly underscored the value of the students’ work as well. Addressing an audience of approximately 150 people at the American Association for the Advancement of Science, study co-chair Jacopo Buongiorno began by acknowledging the efforts of the study team, composed of MIT and non-MIT researchers and advisors. Buongiorno, the TEPCO Professor and associate head of the Department of Nuclear Science and Engineering, cited the contributions of the graduate students at the event and other students who worked on the report as being a vital part of the team effort. In addition to taking audience questions on their areas of expertise within the study, the students answered one from event moderator Professor Robert Armstrong, director of the MIT Energy Initiative (MITEI). He asked what had surprised them as they were working on the study. Amy Umaretiya, a master’s student in the Technology and Policy Program at the MIT Institute for Data, Systems, and Society, worked with study co-chair John Parsons, a senior lecturer at the Sloan School of Management, to examine policy issues. She said that learning that some public policies didn’t incorporate nuclear energy as a low-carbon solution came as a surprise. “The fact that clean energy standards are actually focused only on renewable energy as opposed to [a wider portfolio of] clean energy was a big shock for me,” she said. Dawson, Umaretiya, White, and nuclear science and engineering master’s student Patrick Champlin also participated in meetings at the US Department of Energy, at the Center for Strategic and International Studies, on Capitol Hill with legislators and staff members (arranged by the MIT Washington Office), and at a dinner hosted by the Alumni Club of DC. MITEI, which published the study, sponsored Dawson’s, Umaretiya’s, and White’s travel for the DC events. MIT’s International Policy Laboratory also provided support for outreach on the study. Other students who worked on the study included undergraduate students Rasheed Auguste, Ze (Jenny) Dong, and Ka-Yen Yau; doctoral candidate Lucas Rush; and PhD candidate Nestor Sepulveda, all of nuclear science and engineering. The Future of Nuclear Energy study panelists. Front row (from left): Robert C. Armstrong, Karen Dawson, Amy Umaretiya. Back row (from left): Patrick Champlin, Michael Corradini, Jacopo Buongiorno, Patrick White, David Petti, John Parsons. Photo: Diana Bowen.